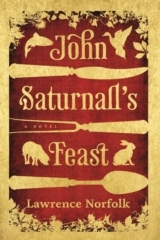 Longtime Friend of Agate Lawrence Norfolk has just published another characteristically brilliant novel, called John Saturnall's Feast, his first in twelve years. Norfolk has traveled a somewhat fitful journey to global literary stardom, one that's set him a little apart from his cohort of mid-career British novelists. He's probably better known on the Continent than he is in his native England, and he's steeply underappreciated here in the U.S.; this should be remedied, as his work is at least as accomplished as that of American contemporaries like Chabon, Egan, Eugenides, et. al. He's coming to America later this month for a brief tour. The new novel is terrific, like all of Lawrence's books--just ask Agate's associate publisher, Diana Slickman, as the Chicago Reader did this week.The title character in John Saturnall's Feast is a gifted 17th-century chef, and Lawrence recently wrote a brief investigation of the challenges involved in writing about food, cooking, and (especially) eating, which is defiinitely instructive stuff for us cookbook publishers.